Be the first to share your favorite memory, photo or story of William "Bill". This memorial page is dedicated for family, friends and future generations to celebrate the life of their loved one. 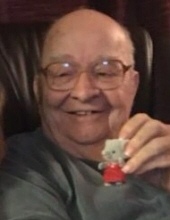 William “Bill” J. Lazeration, age 89, of Necedah, Wisconsin, passed away Thursday, March 21, 2019 at the Mile Bluff Medical Center in Mauston. He was born February 20, 1930 to Anna Lazeration in Paterson, New Jersey. Following high school, Bill served in the U.S. Navy. He moved to Wisconsin in the 50s where he met his future bride, Lois Worden. They were united in marriage on June 22, 1963 in Milwaukee. Bill worked as an equipment operator at Wisconsin Energies until his retirement. He had a true passion for the art of wood working and cabinetry. Bill was an avid reader, especially with history. He loved hockey, especially watching his grandchildren play. He will be missed dearly by his family and friends. He is survived by his wife, Lois; children, Sue McMurry of Necedah, Thomas (Catherine) Worden of New Berlin, and Marie (Dwayne) Richter of Menomonee Falls; grandchildren, April (Malcolm Benskin) McMurry, Sara (Korcan) Demirok, Michael McMurry, Mark (Emily) Worden, Molly Worden, Alexander Richter, and Samantha Richter; great grandchildren, Louisa Benskin and James Worden; and many other relatives and friends. A Celebration of Bill’s Life will be held on Saturday, April 6, 2019, 12:00 p.m., NOON, at the Veteran’s Memorial Hall,105 Plum St, Necedah, WI 54646. Visitation will be held from 11:00 a.m. until 12:00 p.m. A light lunch will be held following the celebration of life service. In honor of his wife, Lois, memorials may be made to the Alzheimer’s Association, 1523 Rose St #8, La Crosse, WI 54603. The Torkelson Funeral Home of Necedah is assisting the family with arrangements. Online condolences are available at www.torkelsonfuneralhome.com. "Email Address" would like to share the life celebration of William "Bill" J. Lazeration. Click on the "link" to go to share a favorite memory or leave a condolence message for the family.